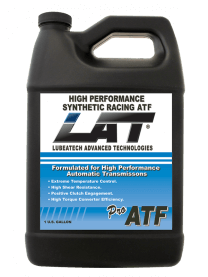 LAT PRO ATF synthetic is specifically blended for use in automatic racing transmissions. When you’re producing extreme torque, high horsepower, and high temperature ranges, you need a blend that can take the punishment. LAT PRO-ATF delivers! Benefits include cooler operating temperatures, faster lock-ups, smoother shifts, and improved elapsed times. Our exclusive LFR technology reduces wear and offers longer life on all internal parts. Available in 1 gallon, 4×1 gallon, 5 gallon and 55 gallon drums. 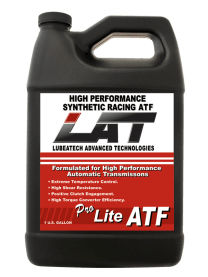 LAT PRO-Lite ATF synthetic was developed for automatic racing transmissions in high altitude areas. Through extensive regress testing our PRO-Lite ATF reduced drag, loosened up converters, and gained RPM’s at the start using this lighter viscosity blend. Now LAT offer racers the advantage of fine tuning your transmissions based on track environments, and operating altitudes. Available in 1 gallon, 4×1 gallon, 5 gallon and 55 gallon drums.